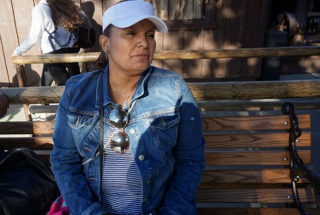 Erika López and her two younger children are one LA Unified family that has experienced homelessness. She is a parent leader and volunteer at Glassell Park Elementary School and has been president of the school’s English Learner Advisory Committee for three years. LA Unified’s school board voted Tuesday to study using district property to house homeless students and their families, despite split public opinion. Kelly Gonez, who authored the resolution, told LA School Report that to her knowledge, this would be a first for the district. Gonez and co-sponsors Mónica García and Nick Melvoin approved the resolution, along with Scott Schmerelson. Richard Vladovic opposed it, though he did not provide comment. George McKenna abstained, saying the resolution left too many questions unanswered, especially relating to cost estimates. LA Unified has not identified any specific locations for homeless housing, but possibilities could include district properties such as school gyms, offices and parking lots. The resolution proposes using funds from Proposition HHH, a bond measure voters approved in 2016 that granted the county $1.2 billion to aid the homeless, including building affordable housing. Beutner told the board Tuesday that he agrees “this is an important issue,” though he added that he’d like to hone his focus — at least to start — on Telfair Elementary in Pacoima, in the northeast San Fernando Valley. Nearly 24 percent of the school’s 700 students are considered homeless. The resolution was met with mixed reactions from residents. At least seven speakers expressed support or reservations before the packed boardroom. Michael Murray, a Carlton Terrace resident who lives two doors down from the now-vacant Oso Avenue Elementary School site in Woodland Hills in the San Fernando Valley, said he worries about the “inevitable effects that such a program would have on the community, such as crime [and] drug use.” Oso has not been identified as a housing site, but Murray and at least one other resident who spoke assumed it will be flagged as an option. Principal Alfredo Montes of Langdon Avenue Elementary School, on the other hand, said he “wholeheartedly” supports the resolution’s goal to expand services for homeless students. About 20 percent of his 129 students qualify as homeless — many of them living “doubled up, or even tripled up, with other families,” he said. There are between 16,200 and 21,000 homeless students in LA Unified, depending on who’s counting. Last year, the number of homeless students in LA Unified spiked 50 percent from the previous year as the district doubled its staff who work with the homeless from 14 to 29 people. Apart from housing, the resolution also calls for reviewing the efficacy of the 12-year-old Homeless Education Program, and asks the district to examine the possibility of adding counselors — Gonez said there are fewer than 100 in that program now. It seeks to bolster professional development opportunities for schools’ “homeless liaisons” as well. This liaison is oftentimes a staff member, such as a teacher, who is volunteering to be a resource for his or her school’s homeless students. Affordable housing can also spark public opposition. In neighborhoods such as Venice, residents worry adding temporary shelters will attract more homeless people to the area. In San Jose Unified School District, which is entertaining the idea of using nine district-owned properties to build new affordable units for teachers and other school employees, some residents fear development would lower home values, ruin neighborhood aesthetic and worsen traffic. A separate resolution, co-sponsored by García and Melvoin, was introduced Tuesday that — like San Jose — would consider developing “affordable workforce housing” for eligible district employees, such as teacher assistants and cafeteria workers. That resolution is scheduled to be voted on at the board’s Dec. 11 meeting. *This article has been updated to add a Nov. 28 letter from Beutner and Gonez to city and county officials.